You are assigned the task of redesigning the company’s flagship application to improve its performance. The application is data intensive. For performance testing, the systems administrator instructs you to create a RAID-5 volume with three drives. What disk configuration should you use? A dynamic disk with three physical hard drives should be used. 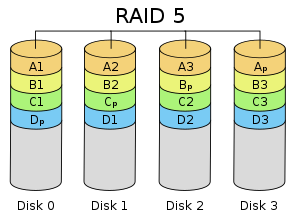 In a RAID-5 configuration, at least three physical disks must be used on a dynamic volume.